The Pulse & Signal Generators section of the Control and Measurements library contains the PWM Generator (2-level) block. This is an improved version of the PWM Generator block. The new block features a mechanism that eliminates duplicate continuous and discrete versions of the same block by basing the block configuration on the simulation mode. If your legacy models contain the PWM Generator block, they will continue to work. However, for best performance, use the PWM Generator (2-level) block in your new models. The PWM Generator block generates pulses for carrier-based pulse width modulation (PWM) converters using two-level topology. The block can be used to fire the forced-commutated devices (FETs, GTOs, or IGBTs) of single-phase, two-phase, three-phase, two-level bridges, or a combination of two three-phase bridges. The pulses are generated by comparing a triangular carrier waveform to a reference modulating signal. The modulating signals can be generated by the PWM generator itself, or they can be a vector of external signals connected at the input of the block. One reference signal is required to generate the pulses for a single- or a two-arm bridge, and three reference signals are required to generate the pulses for a three-phase, single or double bridge. 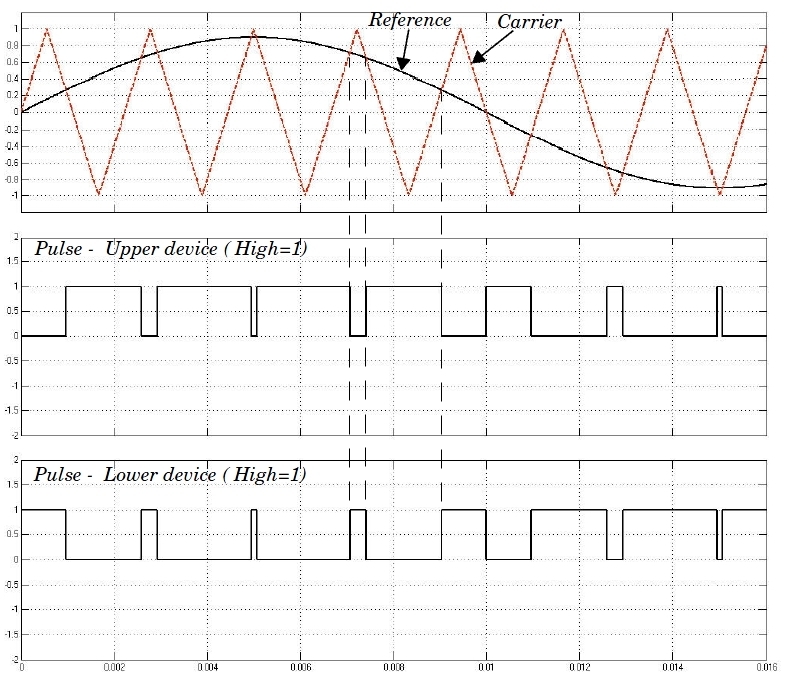 The amplitude (modulation), phase, and frequency of the reference signals are set to control the output voltage (on the AC terminals) of the bridge connected to the PWM Generator block. The two pulses firing the two devices of a given arm bridge are complementary. For example, pulse 4 is low (0) when pulse 3 is high (1). This is illustrated in the next two figures. The following figure displays the two pulses generated by the PWM Generator block when it is programmed to control a one-arm bridge. The triangular carrier signal is compared with the sinusoidal modulating signal. When the modulating signal is greater than the carrier pulse 1 is high (1) and pulse 2 is low (0). For a single-phase two-arm bridge the modulating signal used for arm 2 is the negative of modulating signal used for arm 1 (180 degrees phase shift). For a three-phase six-arm bridge the three modulating signals used for bridge 2 are the negative of the modulating signals applied to bridge 1. The following figure displays the six pulses generated by the PWM Generator block when it is programmed to control a three-arm bridge. Specify the number of pulses to generate. The number of pulses is proportional to the number of bridge arms to fire. Select 1-arm bridge (2 pulses) to fire the self-commutated devices of a one-arm bridge. Pulse 1 fires the upper device and pulse 2 fires the lower device. Select 2-arm bridge (4 pulses) to fire the self-commutated devices of a two-arm bridge. Four pulses are generated for a two-arm bridge. Pulses 1 and 3 fire the upper devices of the first and second arm. Pulses 2 and 4 fire the lower devices. Select 3-arm bridge (6 pulses) to fire the self-commutated devices of a three-arm bridge. Pulses 1, 3, and 5 fire the upper devices of the first, second, and third arms. Pulses 2, 4, and 6 fire the lower devices. Select Double 3-arm bridges (12 pulses) to fire the self-commutated devices of two six-pulse bridges connected in a twelve-pulse bridge configuration. The first six pulses (1 to 6) fire the six devices of the first three-arm bridge and the last six pulses (7 to 12) fire the six devices of the second three-arm bridge. The frequency, in hertz, of the carrier triangular signal. If selected, the modulating signal is generated by the block. Otherwise, external modulating signals are used for pulse generation. The default is unselected. The Modulation index parameter is visible only if the Internal generation of modulating signal (s) parameter is selected. The amplitude of the internal sinusoidal modulating signal. The Modulation index must be greater than 0, and lower than or equal to 1. This parameter is used to control the amplitude of the fundamental component of the output voltage of the controlled bridge. This parameter is only visible when Internal generation of modulating signal(s) is selected. The Frequency of output voltage (Hz) parameter is visible only if the Internal generation of modulating signal (s) parameter is selected. This parameter is only visible when Internal generation of modulating signal(s) is selected. The frequency, in hertz, of the internal modulating signals. This parameter is used to control the fundamental frequency of the output voltage of the controlled bridge. The Phase of output voltage parameter is visible only if the Internal generation of modulating signal (s) parameter is selected. This parameter is only visible when Internal generation of modulating signal(s) is selected. The phase, in degrees, of the internal modulating signal. This parameter is used to control the phase of the fundamental component of the output voltage of the controlled bridge. 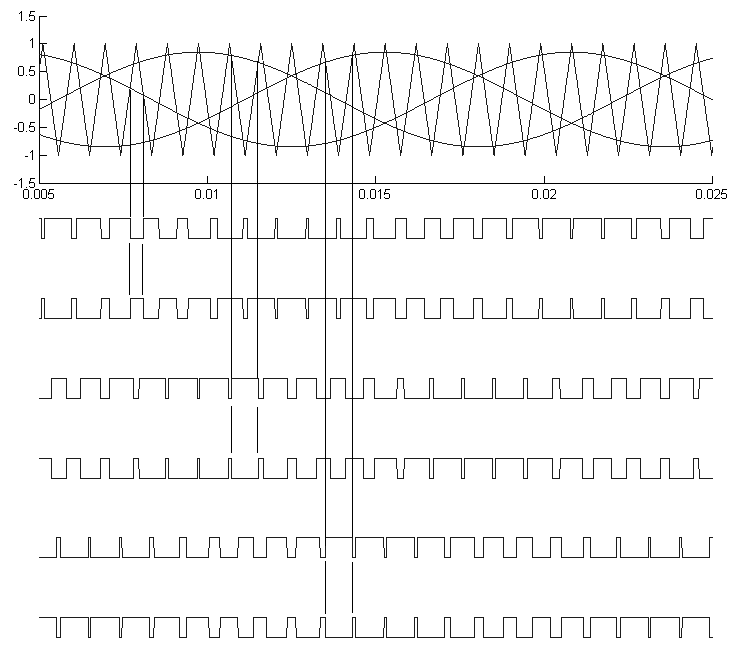 The input is not visible when Internal generation of modulating signal (s) is selected. The input is the vector of modulating signals when Internal generation of modulating signal is not selected. 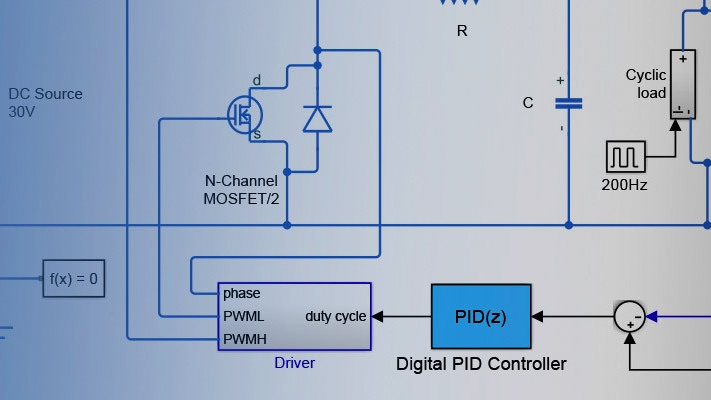 Connect this input to a single-phase sinusoidal signal when the block is used to control a single- or a two-arm bridge, or to a three-phase sinusoidal signal when the PWM Generator block is controlling one or two three-phase bridges. The output contains the two, four, six, or twelve pulse signals used to fire the self-commutated devices (MOSFETs, GTOs, or IGBTs) of single-phase, two-phase, or three-phase bridges or a combination of two three-phase bridges.